The result sees Glasgow complete the treble of Scottish league and cup, and British Championship titles. Livingston and Glasgow kept pace with each other in the early exchanges with the score 9-8 after 20 minutes. However, a 3-1 exchange saw Livingston pull away to lead 15-12 at half time. Livingston kept-up the pace after the break increasing their lead to 21-17. Glasgow came surging back as Livingston’s attack faltered and with 10minutes to go the scores were level at 22-22. Glasgow now had the initiative and although Livingston fought bravely to the end, Glasgow finished stronger and won 31-26 to become 2018 British Champions. Livingston’s Ross Strachan was the final’s top scorer with 12 goals, while Gabriel Fernandez top scorer for Glasgow as he beat the keeper nine times. The event brought together Glasgow, and second-place Scottish side Livingston, along with English champions London GD and runners-up Olympia. On Saturday, in the first semi-final, Glasgow set the pace from the beginning, as Olympia’s finishing in front of goal let them down. However, at half-time the London club still only trailed 12-15. In a heated second half, Glasgow pulled away, helped by numerous suspensions for Olympia and established control on the game, going on to win 30-22. Michael Thomas top-scored for Glasgow with seven goals, while Carlos Navarro replied with five strikes for Olympia. In the second semi-final London GD struggled to get into their stride against a young Livingston side playing with plenty of pace. At half-time the Scots were 15-10 stretching their lead to 21-13 early in the second period. London GD did not let their heads go down and found their feet to storm back to 23-21. However, Livingston regained their composure to win 29-26 and set-up an all Scottish final. Lewis Gannon scored nine goals for Livingston, with Jordi Ferrer-Torras hitting the net five time for GD. 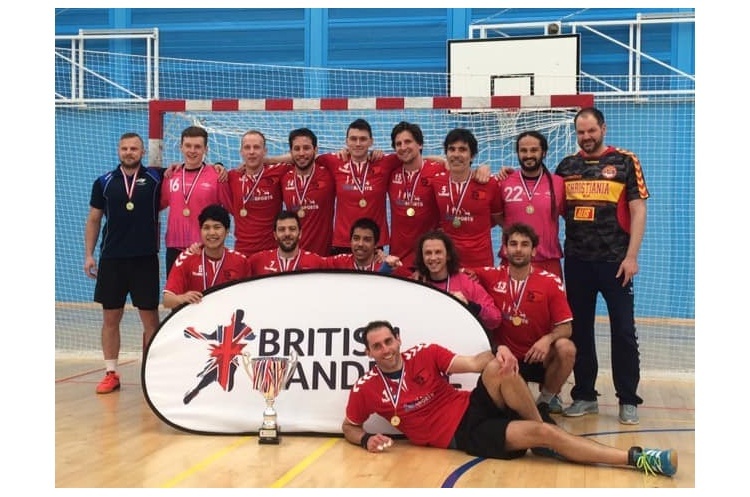 In the bronze medal match on Sunday, Olympia misfired in the opening exchanges and were quickly 7-3 down, slipping to 12-5 down against a polished London GD side. Olympia came storming out of the blocks in the second half, scoring three quick goals. Dan Dragu also made some great saves to help Olympia as GD struggled for ideas. With six minutes to go Olympia were level at 18-18, but GD kept their composure and hung on to win 22-21. Danut Nelutescu scored seven times for Olympia, while Alexander Ratner bagged five for London GD. A big thank you to the teams, official and spectators, and in particular to the Scottish Handball Association for a great event.